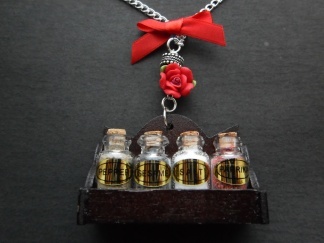 Unusual kitsch style spice rack bow necklace on a silver plated chain with four popular spices. Four spice jars sitting in a wooden pendant rack with fimo red rose and bow design. The spice jars are filled and sealed and embedded into the rack. The chain is nickel free and 18in long, but other lengths are available.